The Dependence Network shows interconnections between frequent events and statistical data for these interconnections. A number of the most frequent events (rearrangements) is selected by the user and displayed in the viewing panel. The interconnections between them are shown as lines between the buttons representing the rearrangements. By clicking such a line, more information on that interconnection is displayed in the info panel. 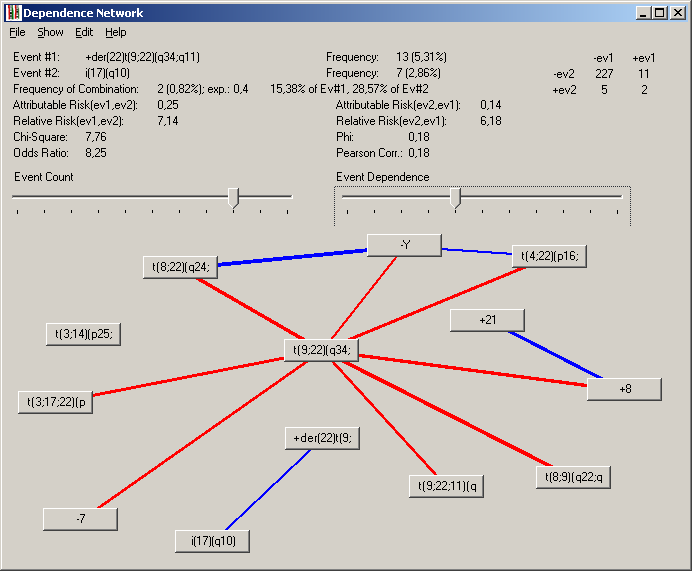 The evolution dependence network is opened from the menu of the main window. Select "Mine - Dependence Network" from its menu. There upon the dependence network window is opened, but the dependence network is not yet calculated. You may edit the parameters first. To show the dependence network, select "Show - Dependence Menu" from the menu (the "Show - Report" menu is not yet functional). The window is divided into three sections: on the lower panel (= viewing panel), the dependence network proper is shown. On the upper panel (= info panel), statistical information is shown on a selected rearrangement or interconnection of a pair of rearrangements. In between, there are two track bars for adjusting the number of events shown and their minimum dependence. For all info labels, tooltips are available: often the texts are too long to be shown in their proper position, then moving the mouse over the corresponding element will show up the full text. The number of events shown can be adjusted with the right trackbar ("Event Count"). Moving it to the right adds the next most frequent event, moving it to the left removes the least frequent one of the events shown. Newly added events are placed at random on the viewing panel.They can be moved by clicking with the right mouse button on them and drawing the mouse to the desired position while keeping the right button pressed.During moving, the lines connecting the events are updated which may require some computing power. Between events, their dependence is shown by lines. Blue color denotes positive dependence (the events occur together more often than expected), red color denotes negitive dependence (the events occur together less often than expected). The thicker a line, the more reliable is such an interconnection. The Event Dependence trackbar on the left sets the minimum reliability of a dependence between two events. Internally, the chi-square value is used for comparison. To see reliably dependent events only, move it to the right. To see more interconnections, also less reliable ones or even unreliable ones, move it to the left. When you want to see all interconnections, set the minimum value of the Dependence Line Adjustment parameter to 0. 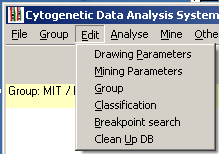 Technical information on the DependenceViewer control is available from the Data Mining documentation. The "Save" menu allows you to save the dependence netweork which is displayed in the viewer panel into an image file. The buttons are replaced by ellipses of sufficient width for the texts, the positions are taken from the viewer panel. "Dependence Network" shows the dependence network. If a recalculation is required (e.g. after editing the parameters), this function starts the calculation. "Arrange Circular" rearranges the events on the viewer panel. The most frequent event is shown in center top position, followed by the other events with descending frequency in clockwise arrangement. "Report" is not yet implemented. By clicking onto a line, the rearrangements connected with this line are selected, and a number of statical information is displayed in the info panel. All statistical calculation require a large enough number of cases. In the example shown below, this precondition is not fulfilled! Also note, that a clear definition of the statistical numbers does not exist! Depending on your source, different calculations may be found. More on the technical background is available in the Technical Documentation. The names and their frequencies are displayed as the first items of information. Here, you can check that you really selected the rearrangements you wanted to select. Futhermore, one event becomes defined as the first event (event #1, ev1), the one as the second event (event #2, ev2). This definition is used as an abbreviation in later descriptions. On the upper right of the info panel, a four fold table showing the occurences of the events and their combinations is shown. In this example, 227 cases had neither event 1 nor event 2. 2 cases had both events, 11 cases had event 1 but not event 2, and 5 cases had event 2 but not event 1. This line shows up how often both events were encountered together. The frequency is also expressed as a percentage of all karyotypes and percentages of karyotypes with event 1 or event 2, resp. In the above example, 2 karyotypes among 245 karyotypes had both rearrangements, corresponding to 0.82%. The expected number is calculated from the marginal distribution: (cases with event 1) times (cases with event 2) divided by (number of all cases), i.e. 13 * 7 / 245 = 0.4. The two cases having both rearrangements correspond to 15.38% of cases with event 1 (= 2 / 13), and to 28.57% of cases with event 2 (= 2 / 7). The attributable risk indicates what percentage of cases with the second event are caused by the first event. This attributable risk can also be seen the other way round: what percentage of cases with the first event are caused by the second event. In our example, 25% of cases with an i(17)(q10) are "caused" by a +der( 22)t(9;22)(q34;q11), while 14% of cases with a +der(22)t(9;22)(q34;q11) are "caused" by an i(17)(q10). Note that this is just a statistical interpretation; check if there are scientific reasons which would allow for such an interpretation. The Relative Risk is also called Risk Ratio or Hazard Ratio. One event is treated as a putative cause for the second event. Then the percentage of cases which have the "causing" event and acquired the "caused" event is compared to the percentage of cases which do not have the "causing" event but nonetheless acquired the "caused" event. Also here, cause and consequence can be interpreted in both ways and must be supported by sound scientific reasons. In our example, the risk of getting a +der(22)t(9;22)(q34;q11) is some 7 fold increased for patients already having an i(17)(q10), and the risk of getting an i(17)(q10) is some 6 fold increased for patients already having a +der(22)t(9;22)(q34;q11). The chi-square value is a measure for the significance of combinations. Here, a negative sign was added for pairs of events which or occur less often than expected. In our example, the chi-square value is 7.76. This means that the events occur more often together than expected, and that this combination is significant at a 5% error level (required chi-square: 3.84). The phi value stands for the correlation (also called contingency) between the two events, without explaining its reliability, but showing a direction ("negative" vs. "positive" correlation). In the four fold tables used, Phi can vary between -1 and +1. This number compares the ratio of cases without event 2 and cases with event 2 under the procondition of event 1 on one side to the ratio of cases without event 2 and cases with event 2 under the procondition of the absence of event 1. It can also be seen the other way round, but the value is symmetric in both views. The Odds Ration can vary between 0 and (positive) infinity. The Pearson coefficient (also called Contingency Coefficient or Pearson's C) is calculated as the square root of chi-square divided by the sum of chi-square and the total number of cases. This coefficient can vary between 0 and the square root of 0.5 (ca. 0.71). Dividing it by the latter maximum value gives raise to "Sakoda's adjusted Pearson's C". 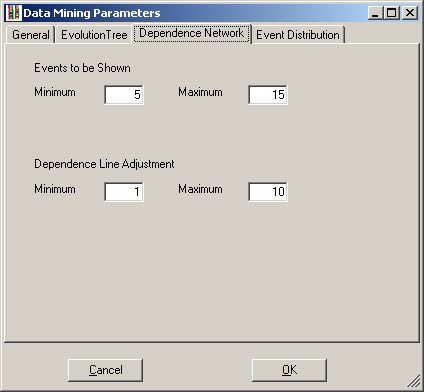 The dependence network parameters can be accessed from the "Edit" menu. Both submenus will open the same edit window, but with the appriopriate tab selected. Editing the parameters via this menu will change the parameters for subsequent calculations of this window only.